Elizabeth Edwards is in a poor position to accuse anyone other than her husband of lying. The National Enquirer may or may not have been right on every accusation but it has not yet been proven that they were lying. In contrast, it is clear that John Edwards has been lying since last October when he has denied having had an affair with Rielle Hunter. Her main accusation that The National Enquirer lied is based upon the denial that Edwards is the father of Hunter’s child. Possibly they were lying, but it is also possible that either they are correct, or that if they were incorrect they did believe that Edwards was the father. Knowing that Edwards has been lying about the affair since they exposed it last October, it is understandable that anyone would also suspect that Edwards was the father. There has still not been an explanation of the pictures–which may or may not mean that Edwards is the father. Short of a paternity test, Elizabeth and John Edwards are going to have to live with the fact that there remains reason to believe John is the one lying on this point. He very will might also be lying to Elizabeth as if John is the father it would mean that the affair continued after the recurrence of Elizabeth’s cancer was known, and after John claims the affair was over. There’s this thing about being caught in a lie. People tend to assume, often correctly, that other things you say are also lies. Lee Stranahan brings up another good point. If she knew about the affair she should have never let John run for president this year. Imagine if Edwards had won the nomination, and then this story broke. Besides, it still might have been possible for Edwards to run in the future if he had admitted the affair. Knowledge of an affair in one’s past does not prevent one from running for president. John McCain is proof of that. I think there is good reason why Edwards did not take this route. He has been more interested in immediate gratification in his search for power. While I agree with Stranahan on this point, I disagree when he writes “I believe that the Edwards are both sincere in their stated positions about poverty, health care and other issues.” Even before this scandal, I believed Edwards was one of the biggest phonys in politics of either party, as I have often written in the past. This is a guy who has shown no real interest in public service unless he could have the big prize. Edwards’ major talent has been in enriching himself while conning supporters into believing he was acting altruistically, beginning in the days in which he specialized in convincing southern juries that birth defects were the fault of medical malpractice. He served a single term in the Senate and used this purely as a stepping stone to run for president or vice-president in 2004 and then got out. While running with Kerry he was more interested in positioning himself for a future run than in helping the ticket. He quickly changed from a moderate Democrat to a populist progressive based upon gaining support in Iowa and in the netroots. I don’t think that Edwards was capable of sitting out and waiting to run down the road. This route would also require that he do something of value to keep himself in consideration for the future, and I don’t think Edwards is capable of that. In the past when I have written of my opinion of Edwards, some on the left agreed and many disagreed. 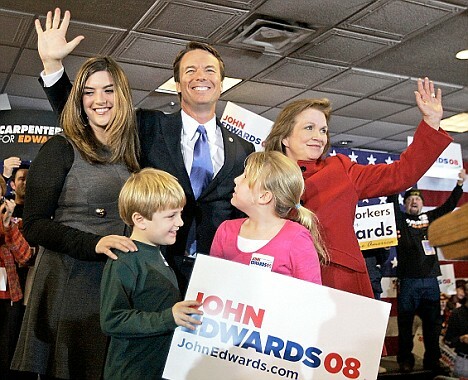 Today’s events should give more people reason to reconsider their opinion of John Edwards. This is especially true of those of you who might have contributed time or money to his campaign under false pretenses. We have a man who has just been confronted with this problem, who is political by nature. And do we really believe that the first thing he thought about is, “I’m going to go protect myself legally'”? I suspect the first thing he thought about is “I’m going to protect myself politically.” He was worried about his family finding out. He was worried about the rest of the staff finding out. He was worried about the press finding out. Bill Clinton and John Edwards are not the only ones involved in presidential politics to be caught having had an affair. John McCain is a senior member of that club. Like Edwards, McCain even cheated on a wife who was suffering from medical problems, having left his wife after she was severely injured in an automobile accident. Interesting that the right wing bloggers are understandably piling on Edwards for his affair but ignoring McCain’s past conduct. As I predicted yesterday, the impact of John Edwards’ affair with Rielle Hunter on his role at the Democratic Convention has provided the mainstream media with a reason to cover the story after initially ignoring it. Additional newspapers covered the story today as Democratic leaders pressed Edwards for a response. After previously claiming that “The story is false, it’s completely untrue, it’s ridiculous, ” Edwards has now admitted to the affair. He denies the accusations that he is the father of Hunter’s child. Edwards, sounding like a lawyer arguing a weak case before a jury, did stress the point that his wife’s cancer was in remission at the time of the affair–a fact which will likely do nothing to reduce the damage to his reputation. Should Edwards turn out to be the father, despite his denials, this would show that the affair continued after the recurrence of Elizabeth’s cancer. He also admits to a recent meeting in a hotel room with Hunter and, while he says Elizabeth was aware of the affair, he says she was unaware of this meeting. Edwards denies recent stories that he has been paying hush money to Hunter. The entire story of the shady lawyer turned opportunistic politician whose integrity was already in question (except to supporters who placed partisanship over reality) being caught in such an affair while his wife is battling cancer sounds like a second rate political thriller. The irony is Rielle Hunter has already been a fictional character of sorts. As I posted a couple of days ago, Hunter had previously dated novelist Jay McInerney. McInerney modeled Allison Price, a drug using bimbo in his book Story of My Life, on Hunter. In an unusual cross appearance in books by different novelists, Bret Easton Ellis also used the character in two of his novels, American Psycho and Glamorama. She does say she is a Republican and shows a preference for McCain, but at least she doesn’t take the usual Republican line that we will be attacked by terrorists and die if a Democrati is elected. Perhaps she realizes that this actually happened on the watch of a Republican, not Democratic, president. She also says she is not interested in running with McCain. Just when you thought everyone had moved on… former advisers to Sen. Hillary Rodham Clinton are in a tizzy over an upcoming piece in the Atlantic Monthly that chronicles the inner workings of the now-defunct campaign. Of particular concern are nearly 200 internal memos that the author, Josh Green, obtained — 130 or so of which he plans to scan in and post online. When the piece is published sometime next week, readers will be able to scroll through the memos, from senior strategists such as Mark Penn, Harold Ickes and Geoff Garin, and see what exactly was going on inside the infamously fractured Clinton organization. That has some former team members in a panic. Actually we knew that it is not the case that everyone had moved on–which might make these emails even more amusing. The PUMA groups continue to repeat all the nonsense put out by the Clinton campaign which anyone with half a functioning brain would have seen through. I doubt that the memos outright admit that most of their claims during the campaign were absurdities raised in the hopes of political gain, but possibly the memos might give some clue. Unfortunately those kooks in the PUMA groups who continue to repeat the Clinton talking points are probably incapable of analyzing these memos rationally. Just in case anyone is searching for an excuse to have a drink today, today marks the second anniversary of the starting of the Liberal Values blog. I imagine that, as backers of Barack Obama in this year’s election, wine would be more appropriate as opposed to beer (unless you prefer to stand up to the people who write about such stereotypes). Should you prefer to celebrate with a mixed drink, the most recent revision of the official Liberal Values Appletini recipe was posted here after last year’s blogiversary.